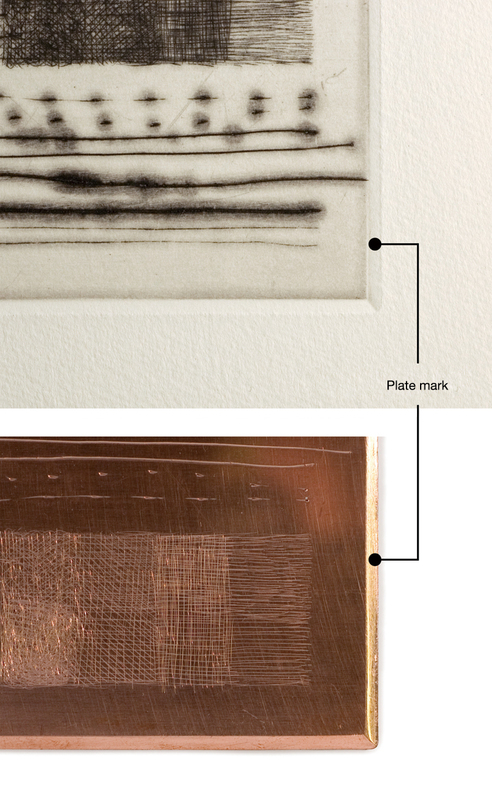 A plate mark is a depression unique to copper plate prints produced when a plate is printed. To ensure that the plate feeds smoothly into the rollers of the printing press and that the paper or felt on which the image is printed does not tear, the edge of the plate is beveled. This slant is called a biseau (French for bevel) and is also sometimes referred to as a plate mark itself. Before making the plate, a fixed width of the outer edge of the plate should be filed diagonally with a metal file (to make the plate mark). The width of this margin depends on the size and thickness of the copper plate used but it is usually around 2mm to 3mm wide, slanted at an angle of 30 to 40 degrees. When doing this, the plate should be secured with a vise, clamp or tape. When the bevel is ready, round off the corners. Once you have finished making the drawing and etching the plate, you must amend parts that were etched by mistake and any damage to the image (Retouching of plate mark). A metal file is used again for this, but care should be taken so as not to damage the completed plate surface. After polishing with a metal file, use a scraper to remove the burrs. Then spread a few drops of machine oil with your finger and polish it carefully with a burnisher until it becomes shiny. When printing, after loading ink on the plate and wiping the plate all over, use a piece of cloth soaked with ligroin to pinch the beveled edges between your fingers and remove excess ink carefully. Doing this will ensure that the printed work will be surrounded with a frame of sharp, beautifully white plate mark.